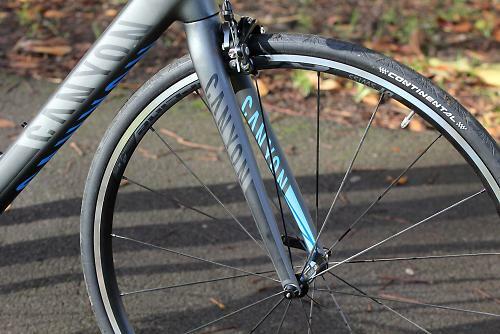 The Canyon Endurace CF 8.0 has a brilliant spec list, an impressive weight for its class and plenty of comfort, so why has this review been a struggle to write? Well, there is a vital ingredient missing and without it the dish is lacking a bit of flavour. Let's break it down a bit and I'll try and explain what I mean. 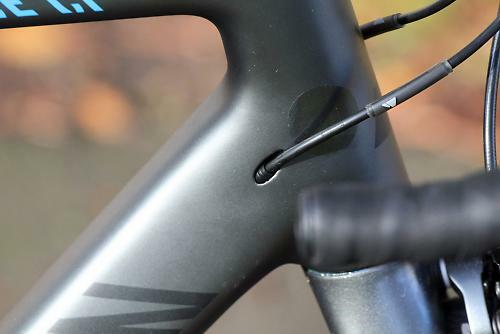 For £1,299 you're getting the same frame as found on the top flite Endurace Dave Arthur tested a few months ago, the CF 9.0 SL, and what a frame it is too. The thing I found most notable was the ride quality. Designed as an endurance bike, the CF 8.0 needs to deliver both performance and comfort without compromise, a big ask for any frame maker. Just like any other material, carbon frames need to be designed by someone who knows what they are doing to turn a good-feeling frame into a brilliant one and the bods at Canyon certainly know their onions in that respect. VCLS (Vertical Compliance Lateral Stiffness) technology is what they call it and it's all about putting the material where it needs to be and in the direction you want it to flex. The CF 8.0 has a tapered head tube and everything else on the bottom half of the frameset has been beefed up to withstand the forces coming from the rider and road. What this produces is a buttery smooth ride that feels more like steel or titanium as it absorbs every road imperfection without feeling soft. The benefit of this in reducing rider fatigue over a distance of 100 miles is marked. The Merckx EMX-1 I tested recently felt the same and highlights why the frame is always the heart of the bike rather than just a component. The slender fork legs reduce road buzz travelling up to the rider's hands though you do feel some flex under heavy cornering load resulting in a small amount of understeer when really being pushed. Paired to the material setup Canyon have also tweaked the geometry when compared to their race frames. Most notably, They've slackened off the angles a bit and increased the wheelbase to just sedate the ride a little. They haven't gone all-out relaxed, mind, as they've only added 11mm to the wheelbase (989mm on the medium) with 5mm of that being on the chainstays to provide more room for bigger tyres. 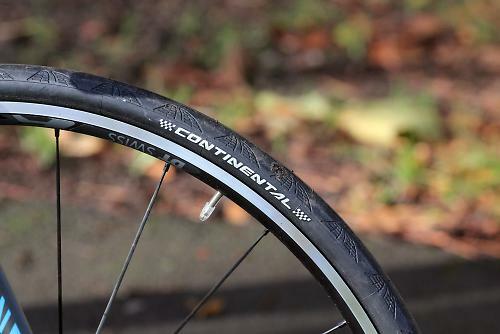 Speaking of tyres the Endurace comes with 25mm Conti Grand Prix 4000s though these are stretched out to 27mm thanks to the wide rim profile of the DT Swiss R24 Spline wheels to give a balance of comfort and grip without the added weight of going for a bigger volume tyre. It does give you a slightly different tyre shape but it's not something that affects the handling. 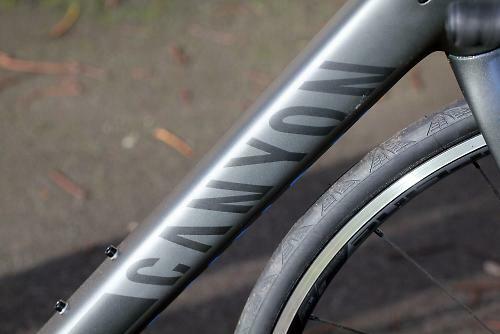 Canyon also supply an own brand VCLS carbon seatpost that is designed using a leaf spring concept allowing the saddle to almost float about and move on big impacts. It works although you do get a few 'false alarms' under heavy pedalling which can be a bit disconcerting. In all honestly I think it's overkill and would be just as happy with a standard carbon post providing you can run with enough out of the frame to achieve some flex. In the real world all this makes the Endurace very easy to ride when you're tired or the conditions aren't too great, either with regards to the surface or weather while still providing a somewhat sporty ride should you want to put the hammer down. Through the bends, especially flat and flowing ones, the CF 8.0 holds a very smooth line with little input from the rider. It's when things speed up, tighten up or both that the Endurace lacks that real crispness in the corners, and leaves you wanting a bit more responsiveness and feedback. Even the short 100mm stem and narrow 42cm bars can't do anything to raise the level of interest. The comfort along with the 7.77kg (17.12lb) weight make the Endurace highly suitable for a mile muncher. It's a bike that is happy in any terrain as it rolls so well. 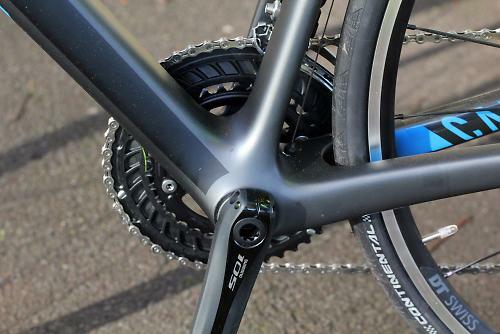 The ratios on the 11-speed cassette mean you're highly unlikely to find yourself in between gears so maintaining speed with changes in terrain can be done from the saddle, again making a big difference to tiredness over the course of a long ride especially on unfamiliar roads. The Endurace will sprint if you ask it but it's certainly not its forte. You don't exactly get back what you're putting in, and it all feels a little subdued to me. It does stay planted though even with maximum power going through the frame with none of that rear wheel skitting around feeling as you go for the town sign. 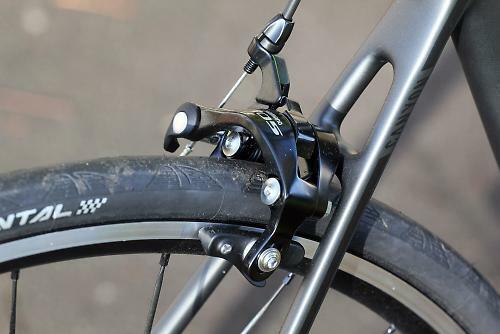 It's impressive to see a full Shimano 105 group at this price point and it matches the solid feel of the Canyon's frame with its positive shifting and controllable braking. The 50/34T, 11-28T gearing pretty much gives you every gear ratio you are going to need for climbing or descending, in this country anyway. The light action of the gear change is another of those little things that add up to reducing fatigue as does the impressive bite from the calipers. Your fingers aren't aching at the bottom of a technical, wet descent from having to haul on the brakes for every single bend. The fact that the new calipers also take up to 28mm wide tyres means they're a perfect match for the frameset's clearance. The rest of the build kit is just as impressive with a full Ritchey cockpit (although this will soon be changing to Canyon's own brand stuff soon as per their website) and a Fizik Vesta saddle. If you were to buy all this stuff separately there is no way you'd make the £1,299 price mark. There don't seem to have been any corners cut with this build and it'll last for the long haul before needing any serious upgrades. 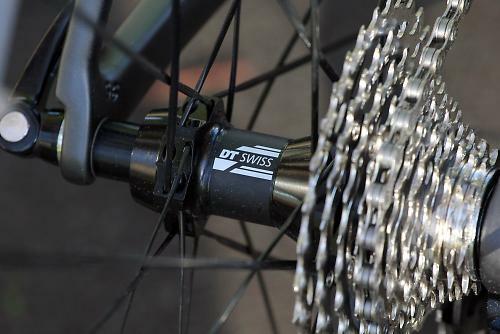 The DT Swiss wheel choice is a really good decision, going for longevity and easy maintenance rather than something that maybe looks flashier to save a few grams. They've managed to do it without sacrificing too much weight either as the claimed wheel weight of 1,764g means they are no heavyweights. They certainly stayed true throughout testing after plenty of back lane pothole smashing. The rims are tubeless ready too, so once the tyres come down to a sensible price there is another weight saving, comfort improving option. So then, the missing ingredient. Can you spot it? The excitement, where is the fun factor! Looking at each component or ride quality in separation the Canyon Endurace CF 8.0 should be topping the road.cc Bikes of the Year for sure. Amazing price and spec list while sharing the same frameset as the top end model, comfortable, stable, decent handling and a competitive weight. But it won't be, why? I wasn't ever really that bothered about getting it out of the shed to ride it or even look at it to be honest. To me that's what passion in your hobby or lifestyle is all about whether it be cars, guitars or whatever, they've got to ignite something inside of you. I understand that the Endurace is designed for long distance and for that an element of predictability is a bonus but I've ridden plenty of other bikes in this category that provide all of that but still get the juices flowing. Don't get me wrong, the CF 8.0 is a great bike, possibly even brilliant when you take everything into account but it's just not as exceptional as its stats would have you believe. "Comfort meets performance" is how Canyon explains the ethos behind the Endurace and thanks to a well designed frame it delivers in both respects. With the slightly more upright ride position and extended wheelbase it's definitely one for the long distance rider for the likes of sportives or credit card touring. The overall quality of the frame and fork is to a very high level both cosmetically and structurally. The frame and fork is full carbon fibre laid up to provide stiffness and comfort at the same time. More relaxed and a longer wheelbase than Canyon's race frames to provide a more stable platform for a long distance ride. How would you describe the steering? Was it lively, neutral or unresponsive? Very neutral especially at higher speeds. The handling is good at cruising speeds and taking flat corners though becomes a little vague at the top end. My overall sum up of the Endurace CF 8.0 is that it doesn't anything particularly badly but then it doesn't really excel at anything either, the ride is very safe and middle of the road. 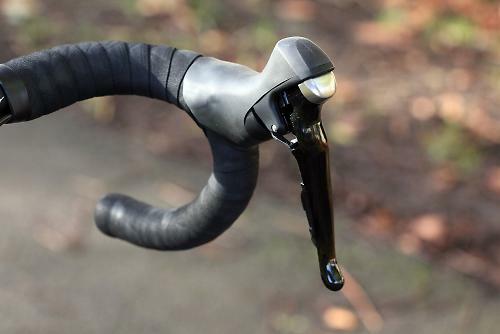 The Canyon seatpost provides a lot of comfort through the flex design, although at times it can be a little too obvious. The Ritchey cockpit is very stiff which helps when descending or pulling on the bars. The rolling benefit of the DT Swiss wheels and Conti tyres makes the Endurace great in changing terrain. Shimano 105 is one of the best value for money groupsets on the market and its great to see a full kit on the Endurace at this price. A very nice wheelset that is tough without being a heavyweight. 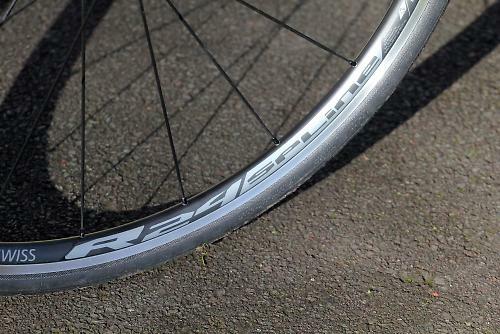 They roll well and the wide rim expanding the 25mm tyre provides extra grip. I liked the Ritchey components for both looks and performance and while the Canyon seatpost does provide plenty of comfort for me it's a bit overkill. Did you enjoy riding the bike? It was okay, a bit too bland though. Would you recommend the bike to a friend? I'd suggest it as an option. The Endurace looks absolutely amazing on paper but bikes aren't all about the stats. The CF 8.0 version is a great bike and you're getting a lot of bike for your money but for me it lacks any sort of excitement and passion. Lowering the weight by changing wheels made it more exciting to ride but I still found the frame to be lacking any real feedback. The CF 8.0 scores 4 stars becauseit is an impressive package but for me the uninspiring ride just stops it being exceptional enough to get that extra half. Height wise it's pretty standard for a sportive style bike with a reasonably tall headtube as is the reach. Full details are at the above link. Spot on for the style of bike, lacks a little top end under hard acceleration. Certainly stiff where you need it for acceleration and climbing but not overly so to be uncomfortable. The overall feeling of comfort is pretty impressive as the carbon design and layup really takes the sting out of the ride without making the bike feel soft. 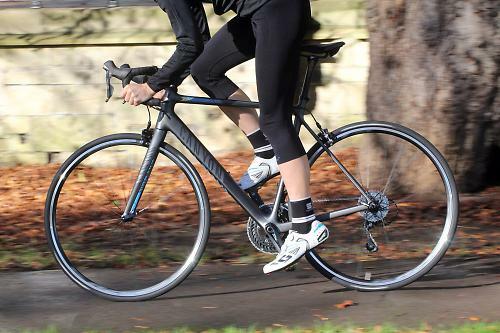 The ride quality is sublime with a smoothness normally reserved for steel or titanium bikes. Do all roadcc testers have their saddle set too high? I think it's more that the bar for the comments section is set too low. "I wasn't ever really that bothered about getting it out of the shed to ride it or even look at it to be honest." I suspect this bike would have got 5 stars if it was painted a bright colour. yep who cares about colour, my new one is likely to be in the same colour as this one, does it matter ? I agree - if they can't manage the basics then why should the review be taken seriously? I had just about settled on getting one of these but now you've gone and made it sound all boring. Since the rider is out of the saddle, the height looks about right. 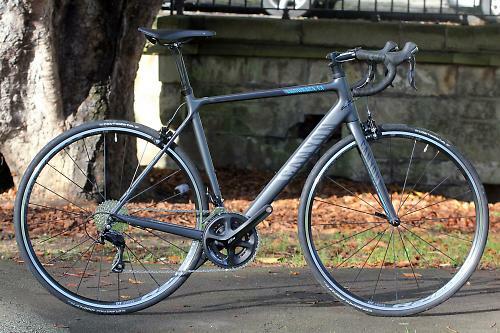 Read the review for the Dura-Ace version -- it's the exact same bike, but with the DA groupset and slightly better wheels: http://road.cc/content/review/130346-canyon-endurace-cf-90-sl-road-bike. No mention of being boring there. If you're after a comfy long distance bike, I'm pretty sure it's one of the best out there, and certainly for the money. This bike lacks "personality" and "real crispness in the corners, and leaves you wanting a bit more responsiveness and feedback." And... "the ride is very safe and middle of the road" and the bike "lacks any sort of excitement and passion." But the 9.0 (same frame), "leans closer to a race bike in its handling" and "remains on the sharper side of the handling divide with a great urgency detectable through the frame and fork when making swift direction changes." It's also "a bike that feels really settled at speed but sparkles when you give it some welly through the corners or up the climbs. It feels closer to a race bike than many of its peers." But the above "needs a bit of personality to make it fun"? Come on, which one is it? Remember, it's the same frame and... "the frame is always the heart of the bike rather than just a component." Surely the rider and the roads define the boredom factor of the bike and not the bike itself? Kind of goes to show that you should definitely try out a new bike, not just go on someone else's review of it. One person's perfection certainly isn't everyone's, and it probably depends what you're used to riding just as much as the bike itself. If something's sharper than your regular bike then it's bound to feel 'racier' than if your regular bike is already very sharp and racy. Probably worth mentioning that the two testers are different people, with different needs and expectations? I know what you're saying though, two very similar bikes from the same testing stock should give similar results, for the purposes of cross comparison, but life just isn't that easy. At least it does go to show that you can't, as has already been mentioned, rely completely on a single person's viewpoint. While the frames of the CF 9.0 and the CF 8.0 may be the same the bikes will behave differently due to the near 2lb weight difference. A 15lb build is going to feel quicker and more responsive than a heavier bike will, whether that is why I didn't find the CF 8.0 as engaging as Dave Arthur found the 9.0 I can't say for certain without riding both but I would say its a fair bet. Ignoring the overall scores mine and Dave's findings are actually pretty similar and as I've said in the review the CF 8.0 is a very good bike, though for me compared to what else I've ridden or am riding now I found it rather dull. That's my honest feelings about the bike and I stand by it. This bike has a top frame, brilliant spec, impressive weight and a buttery smooth ride at an amazing price and this results in a bike which is so boring and lacking personality that you can't be bothered to get it out of the bike shed or even look at it. You've said twice now that plenty of other comparable bikes you've ridden are much better. So why not name them. Bikes with a frame as good as this, built up with a spec as good as this (no cheaper substitutions in the groupset) AND AT THIS PRICE (£1299). Food can contain exactly the same ingredients in exactly the same quantities, but it is the 'chef' that makes the dish...special or inspiring. It's like my opinion on a Micra...it's a fugly car usually 'driven badly' by 'non drivers'...it gets you from A to B...but why would anyone that likes driving buy a Micra? It wasn't that pic about which I was commenting. Originally he was travelling L to R and seated. It is something I have noticed before but of course it may be always the same rider. And as an aside I am currently saving for the Dura Ace version. But then I am boring and just get things done. Rose has the CGF-2000 for a little more, a ligther frame and direct mount brakes. Would be nice know how the two compare. I think you are missing the whole point of the review. It's not about being better, I'm not talking about quality or price I'm talking about excitement and fun, which for me means more than any spec sheet. Whether I'm spending £500 or £5000 on a bike I want to enjoy riding it. This Canyon for me didn't give me that so regardless of how good each component is on its own as a package it just wouldn't make me want to buy one. I've used my knowledge of riding the best part of 100 bikes priced from £400 to £10,000 to come to my conclusion, it doesn't mean I'm right or wrong, it's just my opinion and you can use it however you see fit. I've done as you suggested and looked at the reviews of bikes you've published since the beginning of the year before last. If these bikes are "more exciting", then I'd suggest at their respective prices they ought to be. Hi Macbob... Your comments don't seem to make a huge amount of sense, when did cost equate excitement or otherwise?? The entry Canyon Aeroad will most certainly be more exciting that the top level endurance - it's the nature of the beast. No doubt this is a great bike, but admittedly it is hard to make endurance bikes exciting. Even with the best kit on the world the ride always feels buttey but mehhhhhh... no nice twitchy reactive handling, nor do they prance up the hills, and take you down the otherside grinning like a more throughbred race bike would. That is exciting. I note that the reviewer's best bike is a kinesis aithein (frame cost is 650 odd). As a fellow Athein owner, can attest that this is far more exciting than my most expensive bike. But if im going for a long ride I'll take my 2k machine. Apples and oranges. I've been looking at Canyon's for a while and have been so close to ordering but in the final analysis I always hold back simply because they look dull as hell. I hate to invoke "German efficiency" stereotypes but surely they could add some more design flair to their range. They all look the same and stealth black doesn't really do it for me. Other than that they're obviously brilliant bikes. Shame really. What difference will Dura Ace make apart from a couple of hundred grams? Might as well forget all about aesthetics and just concentrate on stats then? I don't think so. I note that the reviewer's best bike is a kinesis aithein (frame cost is 650 odd). As a fellow Athein owner, can attest that this is far more exciting than my most expensive bike. Genuine question: what is it that makes the Athein so exciting, compared to the Endurace CF? Is it stiffer? Better handling? "but I've ridden plenty of other bikes in this category that provide all of that (comfort) but still get the juices flowing". The Aeroad and Aithein are not IN THIS CATEGORY (the latter an aluminium frame famous for being a harsh ride - the former an aero frame). Nor are any of the other bikes Stuart has reviewed and given a better rating to over the last couple of years. The Mercx is closest, but 50% dearer and has cheapo wheels. As you say, Apples and oranges. If there is a better ENDURANCE bike out there at this price, can someone please let me know. In reply to Russ, the checking of the reviews took about 20 minutes and I've been out on my MTB or road bike (a Pinarello racer incidentally, I don't own a Canyon) every day this week. Can you say the same ? 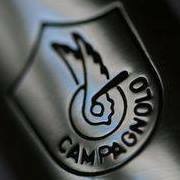 I've just bought one of these, but with the Campag Chorus group. The differences of opinion cited above are just that, diffs of opinion - that's the problem with reviews, they are mainly just personal, subjective opinion. My own opinion and perception of the frame is totally different from the reviewer's. My last best bike was a Cervelo R5, which would presumably have the excitement factor he talks about, more responsive, faster feeling etc. For me, though, the Canyon has more of the excitement factor he mentions, because all I do now is longish relatively slow rides, no racing or hard training in a group. The Cervelo was becoming a bit boring for me, feeling a bit too hard or harsh. I prefer the softer 'plush' feel of the Canyon, more relaxing, less jolting. It has that X factor for me, I really look forward to going out on it. What you find exciting depends on where you are in your cycling life and what kind of riding you do.